Q: Your Wikipedia (online encyclopedia) entry defines you as author, screenwriter, and accordionist. Is that how you would describe yourself? A: I find that nothing makes people back away faster at a social gathering than "accordionist." Except perhaps "screenwriter." And, even "author" always makes people nervous, so I usually say "writer." A: All my life really, since I was able to write all I wanted to do was write. I think largely I ended up becoming a writer because I could think of nothing else that I was good at--at all. As a kid, I always wanted to be a writer, and I had no backup plan whatsoever as an adult. Q: Are the Baudelaire children ever going to be happy? A: Well, they are happy on a regular basis, just not for very long. Um, are they ever going to be happy permanently? I don't know any permanently happy people, thank goodness. Q: Okay, then is the series going to end on a happy note? A: Well, I always remind readers of the Snicket books that happy is a comparative term, so the end will be happier than some people would think, but less happy than others. Q: When can fans expect the final book? A: I believe the thirteenth volume will be released in the fall of 2006, although something terrible could happen to the author at any moment and then the books would not be released at all. 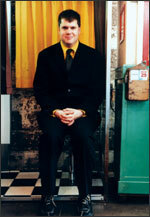 Looking for more from Daniel Handler? Check out his answers to Amazon.com's The Significant Seven. *A full-color print of one of Brett Helquist's most worrying illustrations, suitable for framing or burying in the backyard. *A door-hanger, designed to keep unfortunate events out of any room with a door. *A full page of black-and-white stickers, fit for sticking wherever unfortunate events arise. *An iron-on, which can render any piece of clothing a part of the uniform of a secret organization. Please be warned. This offering is a great deal of misfortune. Lemony Snicket advises against the reading, framing, hanging, sticking, or wearing of unfortunate events. In fact, you might be better off ordering a less horrendous heap, if you prefer that sort of thing. 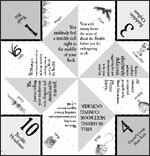 Fans of the Lemony Snicket books can download and fold their own Misfortune Teller, by following these simple instructions. Once the Misfortune Teller is complete, all that is necesary is a willing victim, er, subject, and let the games begin! Lemony Snicket has captured the hearts of childen and adults alike with the hilariously gloomy series that began, of course, with The Bad Beginning. Amazon.com had a chance to question the author of this marvelously morbid and delightfully depressing series, and the communication was grim indeed. Read the cumbersome communique and see for yourself. Best next to last book ever!!! The name of the next book is the Lucky 13, or perhaps, the un-lucky 13. In the final book Count Olaf goes crazy and guns down 13 of his closest neighbors and relatives. He then goes to trial and bribes Judge Earnest, or was it Julio Gallo ? Just when you think Count Olaf is going down; Orson Welles rushes into the courtroom ala Perry Mason and says "Your Honor, we will sell no wine before its time". Count Olaf is aquited of course and the final scene has Oprah on Tom Cruise's couch confessing to a psychyatrist about Tom Clancy molesting her daughter. This will probably not be the last book, as several government agencies are still gambling for the Messiah's clothes....(Drat)! This book is the twelfth book in A Series of Unfortunate Events. This book follows "The Grim Grotto" and precedes "The End." We began in story where "The Grim Grotto" left off. The Baudelaire orphans, Violet, Klaus and Sunny, on her way out of babyhood, have jumped into a taxi driven by none other than Kit Snicket, who is taking the children to an unknown destination. The unknown destination turns out to be the Hotel Denouement. The children's visit to the Hotel Denouement turns out to be a reunion of sorts. The children move through the hotel disguised as concierges and as they move through the hotel they meet many people that they have previously encountered in the first eleven books in A Series of Unfortunate Events. Many of the people they meet are good people and volunteers. They also meet many evil people. The children also meet some people who may be evil, or they may be good. Trying to decide whether certain individuals are good or bad could cause the children a Very Fine Distress. We learn that Hotel Denouement is the last safe place on earth, and volunteers are arriving from all over. Once the volunteers have arrived, certain foul criminals will be tried for their crimes! Or will they? There are lots and lots of plots and the criminals are one step ahead of the good guys, as can happen in the world. As can also happen in the real world, the Baudelaire orphans are involved in the murder of a man by accident. The situation gets hotter for everyone in the hotel as the Baudelaire orphans go on trial, everyone is blinded by their stupidity, a Venomous Fungal Disease is an impending doom, and we wonder how this series can possibly end with the next book. This book is one of the best in the series. This book does a fine job of preparing for the final book in the series. Lemony Snicket answers some questions, but many more questions remain. I await the final book with anxiety and excitement. I wonder how Snicket can end this series in a way that will satisfy his faithful readers. This book by Lemony Snicket is one of the best books that he has written in this series, in my opinion. It has a good plot to it, it's not confusing or boring, and it's not very hard to read either. The plot is that three children are running from Count Olaf and end up getting a job at this hotel only to find out that he is staying at this hotel with a bunch of his friends. The kids have to get a disguise and work there without being caught. This book was purchased, along with Books 11 and 13 in this series, for my nine-year-old granddaughter. She hasn't read it yet, but has read other books in this series and enjoys them very much. The suspects are assembled . . . The suspects are here assembled, as the participants, precipitators, witnesses, and victims of the unfortunate events described in the past 11 books gather . . . . But justice is miscarried in the penultimate event, and the Baudelaire children ponder their guilt or innocence, nobility or villainy. I am a Cornwall New York Sixth Grader and the book I am writing a review on is the Series of An Unfortunate Event book #12 The Penultimate Peril. I found this book to be a fast read. It was very suspenseful and heart stopping. The book starts out when the siblings Klaus, Sunny, and Violet Baudelaire meet up with a mysterious looking woman named Kit Snicket. Kit then drives them to a hotel called Hotel Denouement where many crazy and treacherous things happen. If you would like to know exactly what type of things happen next you have to read the book to find out. If you like sad, miserable and action packed books this is the book for you. Out of the other entire series of books that Lemony Snicket wrote and published, I think this one is the best so far. If I had to rate this book 1-10 I would without doubt, rate it a ten. I would rate it a ten because I really like the plot and theme of the book. I also really like the way the author organizes the events in the books. One more reason I would give this book a ten is because at the end of the book it makes you want to read the next book right then and there. In conclusion, I thought this book was very good so if this review sounds interesting, then you should read the book "Series of An Unfortunate Event book #12 The Penultimate Peril. This is one of my favorite books of all time. The book begins with the Baudelaire orphans in a cab going to a hotel trying to find the volunteers. They become bell boys and bell girls. They answer phone calls and give assistance if needed. There job was to spy on all the guests to spot out the evil people in the hotel. At the end, there biggest ally dies because of a harpoon gun that was accidentally shot. The orphans then go to court but surprisingly escapes with there worst enemy, Count Olaf. They knew they had to find there parents and if they went to jail, they wouldn't be able to. So they finally decided to get away with Count Olaf. I really liked this book for two obvious reasons. My first one is because of all the action and suspense. In this book someone dies, gets stuck in an elevator, and there is a notorious villain. You never know what is going to happen. One of the scariest parts was when Olaf was about to harpoon Dewy when the kids said you will have to harpoon us first? I just couldn't stop reading. I couldn't figure out what was going to happen until it happened. The suspense was overwhelming but I loved it. My second reason is all of the different events going on at the same time. The book even said at one part, you may read the next three chapters in any order you choose because they all take place at the same time. While I was reading what was going on with one kid I was wondering what was going on with another. This is the only book I know that you are able to do this and it is awesome. My favorite part was right before Dewy got hit by the harpoon gun. I had so many thoughts going through my head. I thought, Dewy cant get shot. Can he? What in the world is going to happen. ?All these thoughts were spinning around my head. When dewy finally got shot, I was sweating and just about ready to die. This is an amazing book and I recommend it to all ages above 10 because of all the action. this is the 2nd to last book and is exciting, thrilling, and adventerous! 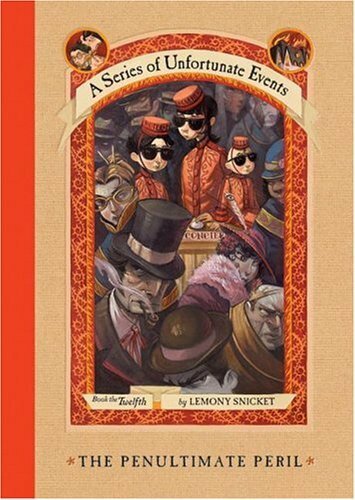 The Hotel Denoument is the 12th book of the Series of Unfortunate Events series. I gave it 5 stars because it was very exciting and kept me wondering what would happen next. It starts out that a pregnant woman named Kit Snicket brings them to the Hotel Denoument in a very cautious way. Her and the three Beaudilaires have a picnic "on top of the roof". Come to find out it was a pond reflecting the hotel. Better or Worse than the others? This Book was exciting, especially when Count Olaf kidnapped Justice Strauss. This book is very well written and carefully plotted with a cliffhanger of a ending! Previous questions are being answered, while new questions are forming. Kit Snicket, Jacques Snicket and LEMONY SNICKET? Connection??? Cant wait till the last book! Tons of filler in this book. Snicket can get more than an entire page worth of that stuff. No good descriptions or plot developments, just list after list after list. He does try to inject a subtext commenting on moral ambiguity but all that gets buried under the Snicket cliches of melodramatic crying kids (stop already! ), wimpy adults who are too poorly written to be witty satires, idiotic evil villains and plot holes. The kids are clever one moment and complete dolts the next. Yup, by this point, I detest the characters and Snicket and this wretched story that never goes anywhere. The lit and linguistic winks don't even begin to compensate for the crappily crafted story. I find it insulting how Snicket manipulates his readers. It seems like the kids tearing up and crying is directly proportional to the increasing crappiness of the stories. Since we're less sympathetic towards the kids because they a.) fail to learn from previous mistakes, b.) fail to seize opportunities, c.) repeatedly fail to use the brains they are reputed to have (for all the inventing skills, reading and life experience, you'd think they'd have a lick of common sense), Snicket makes them turn on the waterworks.